Background: As potent gene regulators, long noncoding RNAs (lncRNAs) are critical in various biological activities, such as cellular processes. 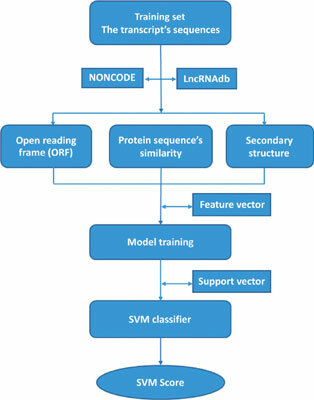 With the development of new sequencing technologies, vast amount of transcriptome data are available, which require efficient computational tools to distinguish noncoding RNAs from their coding counterparts, especially for lncRNAs. Methods: In this paper, we review the advancement of computational methods in predicting lncRNAs, summarize the difficulties in developing machine learning algorithms, and point out a few promising future directions. We also briefly summarize and describe popular softwares and web-servers in the area. Results and Conclusion: Given the exponentially expanding transcriptome data and increasing importance of lncRNAs in disease development and treatment, novel and effective computational tools for identifying lncRNAs are highly demanded. Long noncoding RNA, support vector machine, Random Forest, CPC, LncRScan-SVM.